In scientific style, researchers are slowly narrowing down where the Philae lander arrived on Comet 67P/Churyumov-Gerasimenko. Earlier today (Dec. 17) at the American Geophysical Union meeting, more pictures from the European spacecraft were released showing its landing site and also what the terrain looked like underneath Philae as it bounced to its destination. The pictures were also placed on NASA’s website. The lander is sleeping in a shady spot on the comet’s surface after the dramatic touchdown — actually, three touchdowns — on Nov. 12, when it flew for more than two hours across the surface and bounced as high as two miles (3.2 kilometers). This was partly because harpoons expected to secure it to the surface failed to deploy, and also because the comet crust was icier than expected, according to Gizmodo. You can see in the diagram above Philae’s predicament; it’s wedged in a spot that doesn’t get a lot of sunlight, at least for now. That could change as 67P draws closer to the Sun in the late winter or early spring, but nobody yet knows for sure. And yes, the search for the landing site still continues in earnest, but the challenge now is the orbiting Rosetta spacecraft only has so much bandwidth to send back images, according to Wired. As more high-resolution OSIRIS (Optical, Spectroscopic, and Infrared Remote Imaging System) pictures arrive, scientists hope to figure out where it went. 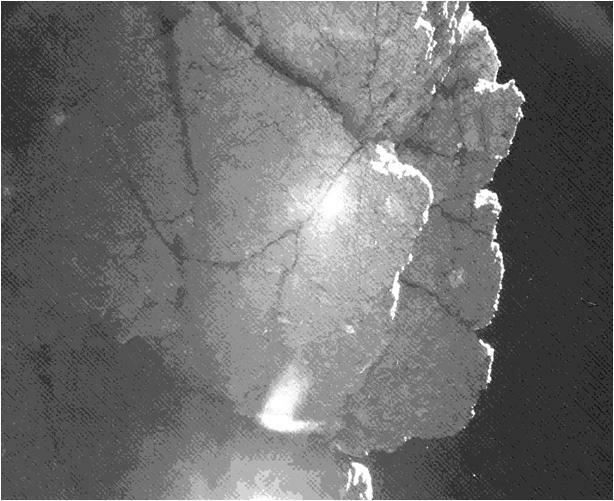 Two pictures from Philae highlighted in today’s release are below. Will the lander take more? Scientists certainly hope so, but even if that doesn’t happen, the lander was only expected to return 20% of the science results in any case. Rosetta is still active and will stick with the comet through mid-2015, when 67P gets closest to the Sun. The next lander of this sort should have some solar panels on the feet as well, in case it also ends up standing on its side in a ravine. I’ll bet the next SERIOUS lander will have some means of gentle propulsion, and a navigation program that will guide it precisely and gently to a preselected site. And if that site proves uninteresting, it will be able to push off and be guided precisely to the next selected site. That is what we can do now with quad-copter “drones”, (based on GPS, and using our atmosphere for propulsion). While these will obviously both be absent on small asteroids and comets, other means will work just as well. Now THAT will be IMPRESSIVE!